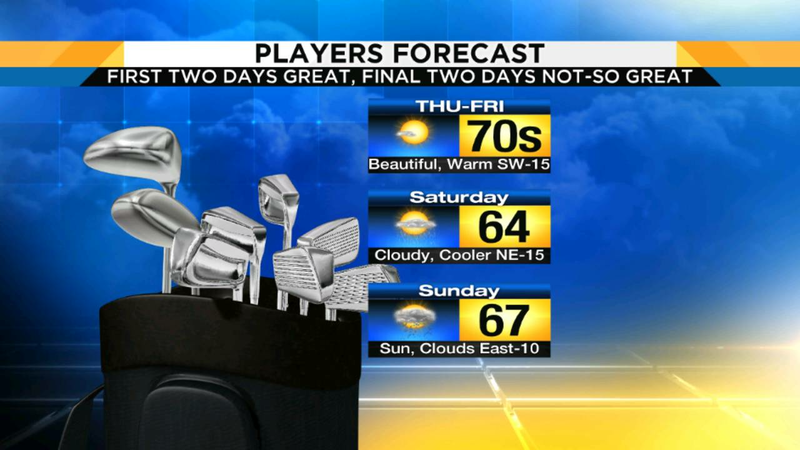 The Players Forecast: Don't forget the sunscreen! PONTE VEDRA BEACH, Fla. - Once again, busting out the weather statistics and finding a few nuggets about this year's Players Championship. The super obvious? We are back to March and so expect it be chillier. Not only is this year's Players in March but from what I have gathered this will be the current permanent Players schedule from here on out. The new time frame, the second weekend in March. This is different than last time it was played in March 12 years ago when it was played on the final weekend of March. Seems trivial, being two weeks earlier, I mean what's two weeks? For Ponte Vedra Beach, a lot. But I'll dive deeper into that next year, this year let's talk about the overall shift so that fans heading out to The Players will understand what they will be up against? The average May temperature for The Players has been, for most, a little warm. The past dozen years The Players has been held in May with the average daytime high (3 pm) of 84° F (29°C) with extremes of 94°F (34°C) and coolest afternoon high of 76°F (24°C). By the way, I will explain what all of the Celsius is about in a moment. For fans, dressing for The Players in May, the theme was "less is best". Those almost hot afternoon highs meant fans could really breakout their summer wardrobe and stay as cool as possible. Where the month of May may be the start of summer, March is all about transitioning into Spring. This means high variability and this year it will be no different. For this year's Players, each day will be unique to itself. This means wardrobe changes for those attending more than one day. Looking at the four days of golf, Thursday and Friday will be, without any doubts, the best weather for fans. Daytime highs will be around 80° with the need for sunscreen as super sunny skies will dominate both days. Yet, Saturday will be a day of transitioning back towards winter. Very early Saturday morning a cold front will pass through The Players and drop afternoon temperatures from around 80° to the mid-60s. Trouble is, it will bring in a wind shift, a lot of clouds and a few showers. By Sunday, fans will need to layer-up further as chilly easterly winds will cap off our temperatures around 63° (17°C) with lots of clouds and some light showers possible. Cold and wet Sunday? Possible. So, there you have it, this year's Players Championship, despite two beautiful days (Thursday and Friday) will be overall the coldest in more than 12 years. Over the first 25 years at the current course, the Stadium Course (The Players has been held on other courses, from Atlanta to Dallas to South Florida and even across the street at the East-West course.) The first 25 were all played in the month of March and only eight times had a foreign national won The Players, that's only 32 percent of the time. When The Players moved to the month of May, foreign nationals have won seven of 12. Double their prior winning rate. Yes, there may be more to this than just the weather, but when you are dealing with the fine subtle art of golf, weather can have a major impact on who wins. Hence, why I put the past temperatures in Celsius.